There is perhaps no other text in our tradition more familiar, more inviting, no words quite as sustaining as these. One writer calls Psalm 23 “our best and truest words about the sum of our life.” And perhaps this is true – there is nothing that so beautifully and succinctly describes the foundation of the life of faith. Of all the Psalms, this is the most well known, most often read at funerals, most memorized. A Psalm of Confidence, it begins with an image deeply rooted in the traditions of our faith: the image of The Lord as Shepherd, and we as his sheep, led to green pastures beside still waters. Our God is a God of abundance and peace, restoring our souls and leading us in right paths. The images are not all of joy, however. Right paths do not seem to be free from darkness or suffering, even evil. Enemies are real, fear is real, all the grief and pain and sorrow we experience, this too, the Psalmist acknowledges, is the path of faith. It is something we contend with, as believers. In a world where so much of our lives are oriented around the purpose of avoiding pain, loss and suffering, to acknowledge these as inevitable is somewhat risky, even counter-cultural. We are a culture of over-protective parents, hyper-vigilant defenses, extra-critical suspicions. Rather than accept suffering as inevitable we tend to cover it up, anesthetizing ourselves with consumption and insulation. Preacher and professor, Barbara Brown Taylor describes this as spiritual bypassing, explaining away pain. And she points out that not only is this impossible but it is counter to our faith in a God incarnate who took on a body, suffered and grieved and then died on the cross. In fact, pain is central to Christianity. Our God is a God with us and for us in all aspects of our lives. Part of the power of our darkest moments is that we so often keep them private and personal. They are our moments of shame and embarrassment. They are the things that amplify our feelings of failure and inadequacy. It is that time when you found your addict brother passed out from an overdose. It is the third rejection letter in a week alongside the deepening panic and increasing debt. It is the mother who no longer recognizes your face. The daughter who is too busy to call. It is the child who hates himself with such ferocity that you feel hopeless to love him enough for him to love himself. It is the silence that has grown like a chasm between you and the person you used to love. It is that person or thing in your life that is so secret, so walled off from the rest of your existence that sometimes even you forget, until it comes crashing in with a force so strong it takes your breath away. The valley is dark and it is real, and we all walk through it. Perhaps we carry it together? Perhaps in those moments of doubt we let those around us be faithful for us, to pray prayers we can no longer utter, to be the community who walks into our darkest valleys alongside of us and help us to breathe. Old Testament Scholar Walter Bruggeman also asserts the necessity of sharing our pain in community. He reminds us again and again the necessary work of communal lament, of crying out in our pain, and of letting God respond. As soon as we go public with pain it is transformed, and as we share it we are bound together in the work of redeeming it. I have been at the bedside of many dying people. 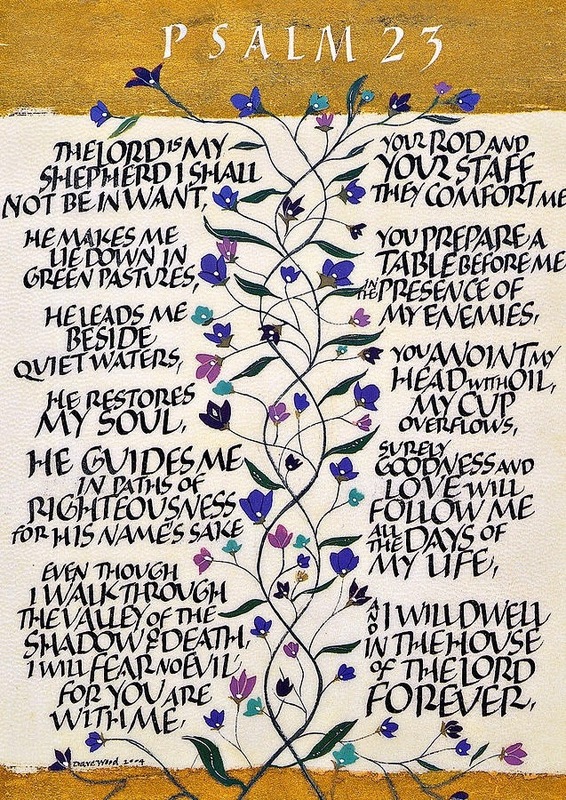 And upon reading and re-reading Psalm 23 it seems that all of those moments flood back to me, along with many other images of the painful valleys I have walked. I remember one time that as a seminary student in Clinical Pastoral Education I was called to the bedside of a man who had no next of kin, no one to sit vigil with him as he drew his last breath. No one to call and inform of his last hours. And so I sat with him, in awe and in fear, as his chest rose and fell and rose and fell and then did not rise. Without words to accompany such a moment I whispered the poetry of Psalm 23. I prayed silently and watched as the nurses reverently washed and wrapped his body. I do not know why he was so alone. Perhaps he had burned all his bridges with loved ones and friends. Perhaps he was an angry abusive man. Perhaps he had just outlived those who he knew and loved and cared for throughout his life. I do not know. But even in the perceived absence and silence there was instead a presence palpable and real. God you were there. You are there. That darkest valley is the valley of our deepest troubles and fears, the place where we think no one will ever accompany us. As the gospel song goes it is the road we have to walk alone. Even though, the Psalmist says. Even though I walk through the darkest valley, I fear no evil; for you are with me; your rod and your staff they comfort me. You are with me when I recognize his phone number and take that middle of the night call, and hold my breath for what comes across the line. You are with me as I walk into the hospital room anticipating whether mom is having a good day or a bad one. You are with me, as I hear the mail drop onto the floor of the entry way. You are with me in the dark of the night, when I wake sobbing and not knowing why. You are with me in the silence and the loneliness. You are with me in the grief and longing. You are with me, O God. I am not alone. No longer The Lord my Shepherd, but You – You who prepare a table of reconciliation, where I will sit alongside those who have done me wrong. You who bless me with love and grace. You who are abounding in steadfast love. God, your companionship transforms every situation. God, your community redeems everything. The Psalmist ends this poetic verse with one final image – a homecoming. The word “follows” might better be translated as “pursues,” which is a powerful twist. God’s goodness and mercy chases us down, pursues us with ferocity, through our darkest valleys and our deepest loneliness. Just as we cannot avoid that valley so we cannot escape the steadfast love God has for us. Until we dwell in God’s eternal home and rest. It may be them most important job we do as the church – to be God to one another as we walk through those dark valleys. To pursue one another endlessly, to stand with one another in love. To courageously let light fall into those private and closed-off places of our lives. To stand vigil when all others have deserted and turned away. To enact the pursuit of God’s steadfast love for each one of us. Surely goodness and mercy will pursue me all the days of my life, and I shall dwell in the house of The Lord my whole life long. Surely goodness and mercy will pursue you, even here. Surely, The Lord is with you, even now. Pursuing you with abundant love, forever and ever, amen. Thank you, Rev. Julie, for this most powerful and meaningful sermon. I was meant to be in the sanctuary that Sunday, to hear your carefully and sensitively crafted words, and I was meant to be sitting near those who share the loss of precious children with me. I counted at least 4 congregation members, as they sat to my right, to my left, and behind me in the pews. Your words soothed, inspired and comforted us. With deep appreciation for your grace and importance presence in our lives at LAC.